No 33 Costa na Mara. 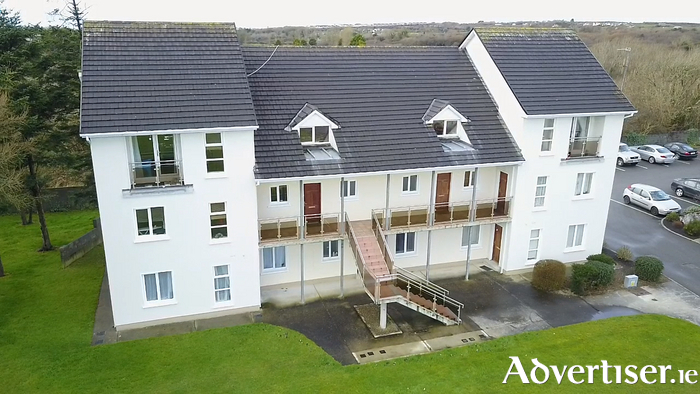 Leading Galway estate agent DNG Maxwell, Heaslip & Leonard is offering a wonderful opportunity to acquire an outstanding two bedroom duplex apartment in a modern development on the Old Coast Road, within walking distance of Oranmore village and only a short distance from the lovely Renville Park. Part of a block of only eight apartments in a mixed residential development, this spacious townhouse comprises approximately 915sq ft of living space and is finished to the highest of standards, ready for immediate occupation. Overlooking a landscaped green area, the property provides ample parking, has PVC double glazed windows, night save storage heating, and extensive tiling throughout. Costa Na Mara is adjacent to all transport links, to include the recently completed railway station and a regular bus services. Accommodation is over two floors and includes an entrance hall, two bedrooms with master en suite, and main bathroom on the ground floor, and a spacious open plan living and dining room with fully fitted kitchen on the first floor. It offers the added benefit of a west facing balcony with sea views, making the most of the afternoon sun. Viewings are by appointment and may be arranged by contacting any of the residential sales team at DNG Maxwell Heaslip & Leonard on 091 565261.